It's time for us to celebrate Brave being the #1 movie in America, don't cha think?? This party would be great for a child, tween, teen or adult - that's one of the things I love about it. You could plan your own Highland Games for a fun activity (see #12) or have your guests make their own coat of arms (see #17). The most important thing is to gather with friends and have a good time. Invitations - I always love these invitations that look like movie tickets. 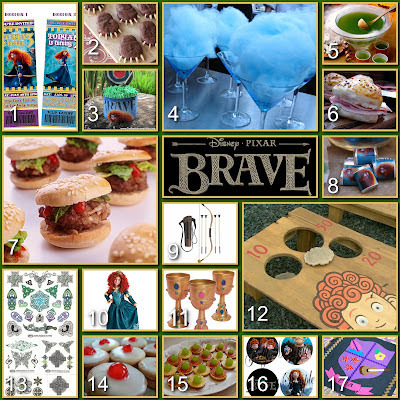 These are absolutely perfect for a party to celebrate the movie Brave itself. Mor'du Claws - These chocolate bear claw cookies are so adorable!! King Fergus would be proud. Brave Cupcake Wrappers - This link takes you to these cute printable cupcake wrappers!! A simple DIY project that takes your cupcakes up to a whole new level. Cotton Candy Wisps - This blue cotton candy reminds me of the Wisps from the movie. Almost everyone loves cotton candy, it's inexpensive and easy to find. This one definitely hits the bulls eye. Witches Magical Mystery Brew - This Witches Brew looks great in a regular punch bowl, but take it up a notch by serving it in a witches cauldron. Keep it cold and refreshing by adding lemon lime soda ice cubes. Mini Hamish Sandwiches - Mini sandwiches are always a hit, this ham and cheese version is a nod to one of the triplets - Hamish. Angus Burgers - Don't worry these cute little sliders are just named after Merida's horse - they are made from Black Angus beef and mini rolls. Nugget Wrappers - These wrapped candy bars are an easy DIY project and guests always love them. I use wrapping paper that coordinates with my theme, it's inexpensive and easy to find. Merida Archery Contest - Between Brave and Hunger Games, archery is becoming a very popular sport. The archery set above is geared toward younger kids with it's rubber tips, but if you have older kids or even adults you can opt for the "real deal." You could give the archery set as a prize for closet to the bulls eye. Merida Costume - How cute is this Merida costume? Disney has definitely done it again. You can pick this one up at your local Disney Store or at Disney Online. Goblets - These gold and jewel encrusted goblets would make any drink taste better, even if you're sipping on Witches Magical Mystery Brew. You could also fill them with jewels (wrapped hard candies) as favors. Triplett's Cake Toss - Add a cake toss to your archery contest and you have the beginnings of your own version of the Highland Games. Here is one from Amazon for $25. Celtic Tattoos - Celtic symbols are see frequently in Brave, you can add them to your party by using temporary tattoos. You can use them in your decor as well, rub them on cardstock circles to make cupcake toppers, napkin rings or decorate your banner, rub them on cups to add a little flair. Empire Biscuits - These are traditional Scottish biscuits (cookies) and they look just like the ones the triplets love so much in Brave. Cracker Targets - These crackers are cute as they are pictured here, but you could also stack them like this - Ritz Cracker, mozzerella or provolone cheese (cut them round using a fondant or cookie cutter), regular size pepperoni, cheddar cheese (cut with a smaller round cookie or fondant cutter), mini pepperoni. Cupcake Toppers - These DIY printable cupcake toppers are adorned with characters straight from the movie. If you own a 2" circle punch they will be simple and quick to do. Coat of Arms - Precut shapes from felt (shield, bow and arrow, music notes, sports shapes, ect.) and let your guests create their own family Coat of Arms. A fun activity for the kids and a great party favor they can hang in their room at home. I hope you have enjoyed the Brave Party Board today. If you have a Brave party I would love to see pictures!! I will have to say goodbye for now, or as the Scots say "Guid Cherrio the nou!!" Love the cotton candy wisps idea! Hayley has the Merida costume on the top if her birthday wish list. I am surprised she hasn't asked for a bow &I arrow set, but I have a feeling that request is coming soon! Great party ideas! Thank you sooo much for this...my daughter just met Merida at Disneyland and changed her Hawaiian themed birthday party to Brave!! I'm sure the party will be lots of fun!! Hope my ideas help you out. Let me know how it goes!! Thanks for linking to my blog for the mini ham sandwiches. They are so easy and so good. The mustard sauce really makes a difference. Great looking party. Thanks Fran! They look delicious!! I love all of BRAVE inspiration! 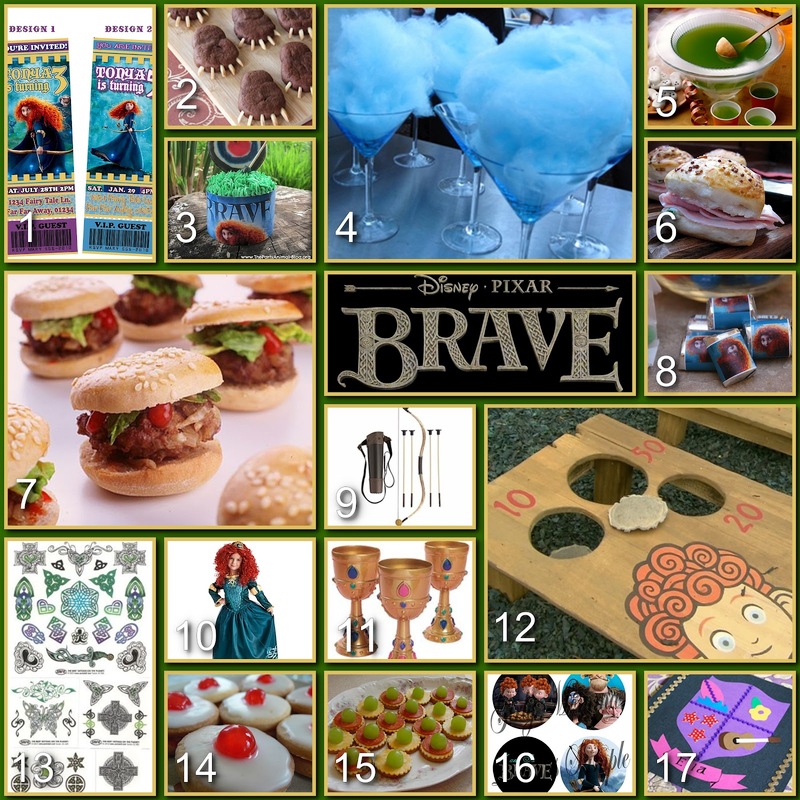 My kids loved the Disney BRAVE movie so in celebration I came up with this FUN banner and bags! I hope you like it! Love the Brave banner! !Well all the Brave items for that matter. Thanks for stopping by! Love this! These are great ideas! Here is a cool idea for a Brae party or just a kid who likes the move! I am not a crafty person, I can make things if I see a picture or have direction. I love all the party boards! !Thanks so much for your hard work! where did you find the goblets?